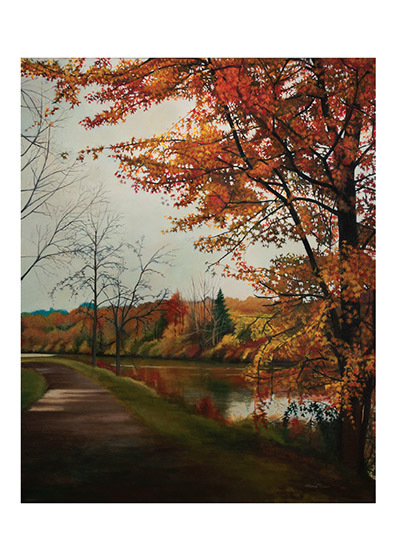 The Wilson Art Gallery will host “Trees of Onondaga”, an exhibit of original paintings by Maria Rizzo, whose paintings, inspired by the outdoors, reflect the gratitude she feels for nature and the human connection to it. Maria Rizzo’s paintings have been exhibited in solo and group exhibitions in galleries and museums throughout the northeast of the United States and abroad, including the ArtRage Gallery in Syracuse, NY; the RSI Bank's 3rd Annual Artists Contest in Rahway, N.J.; and the Museo d' Arte Contemporanea di Lissone in Italy. Rizzo is also the recipient of several awards and honors, in addition to the 2014 Individual Artist Commission Grant from CNY Arts, she is the recipient of an Honorable Mention from the RSI Bank's 3rd Annual Artists Contest in Rahway, N.J., she is the former Artist-in-Residence and Curator at The Tech Garden in Syracuse, New York and she is a 2012 NYFA Mark Alumna. Maria Rizzo was born in Bologna, Italy in 1987. On Friday, January 22, from 4 to 6 p.m., there will be an opening reception for the exhibit, which will be on display at the Wilson Art Gallery from Jan. 22- Feb. 19 during regular library hours. The reception and exhibit are free and open to the public. For more information, call (315) 445-4153.